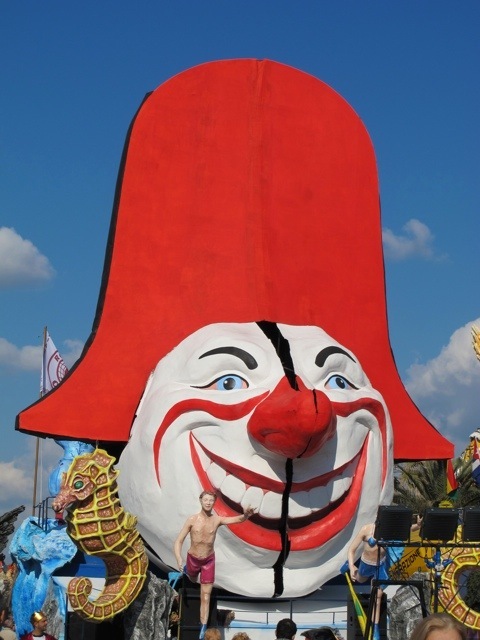 Carnevale happens in Rio di Janeiro, Venice and several other places around the world. 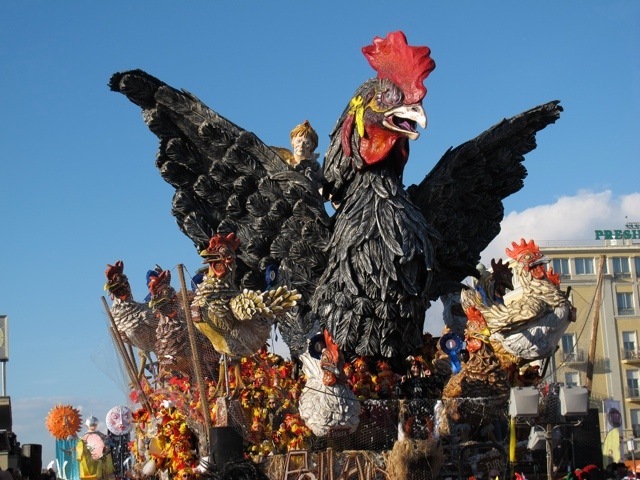 Viareggio has been celebrating Carnevale since 1873, with a couple of breaks around the war years. In 1873 some wealthy residents decided to organise a parade of floats adorned with flowers. 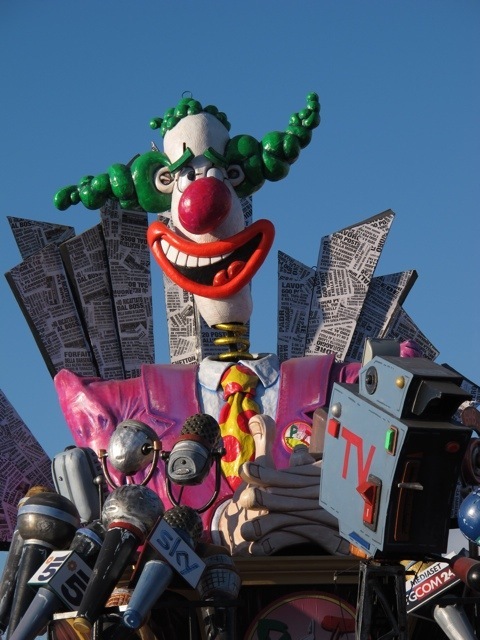 The idea has continued to develop over the years and now huge and intricate floats are made from papier mache and often have a theme of political satire…some of it very cruel indeed. 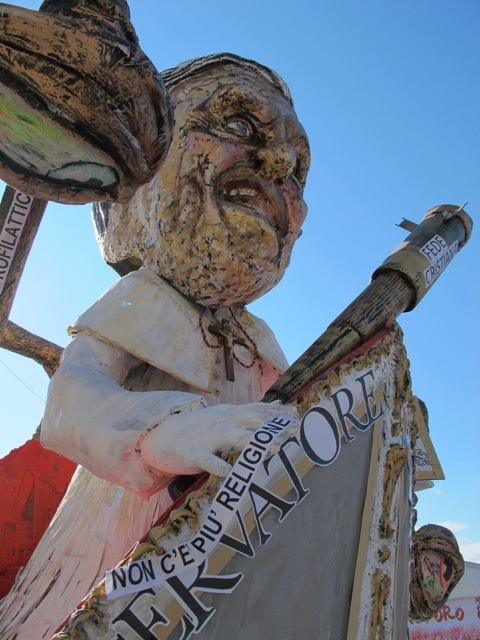 This year was my fourth at Carnevale, and on a beautiful blue sky day I stood with thousands of others to watch the papier mache giants wend they way slowly around the main street of Viareggio. 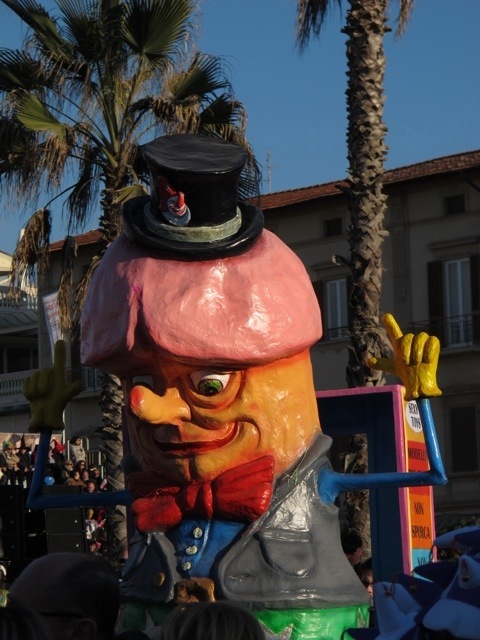 The character Burlamacco was created in 1931 and has become the mascot of Carnevale and the town. He made a large and colourful appearance this year. Pirates were a popular theme this year. 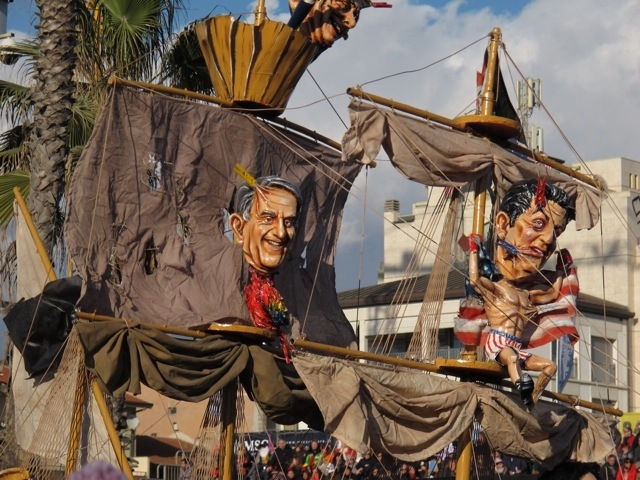 This float managed to combine piracy with plastic surgery…or something with pegs. The No Progress Party…or Italy needs to grow up… made fun of Italy’s politicians. The meaning of the next one is unclear to me, but it was very colourful and pretty. There was a large rooster in a chicken wire coop, being ridden by Angela Merkel and surrounded by chickens representing EU countries. 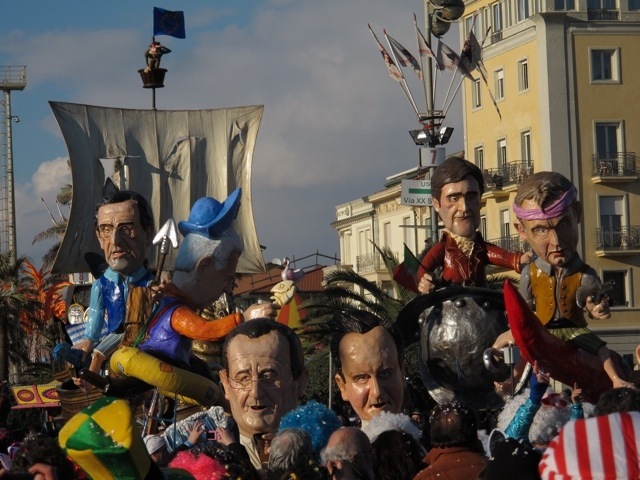 Pirates in the form of European leaders. Religion came in for a little criticism. This one was spectacular and beautiful. I have no idea of the meaning of the beautiful face in prison. It was accompanied by operatic music. The next group caused much mirth with the audience. The media circus was represented…followed by sheep. There was lots more, some of which I will cover in the next post. I missed Berlusconi this year. He made a couple of small appearances, but nothing like previous years. 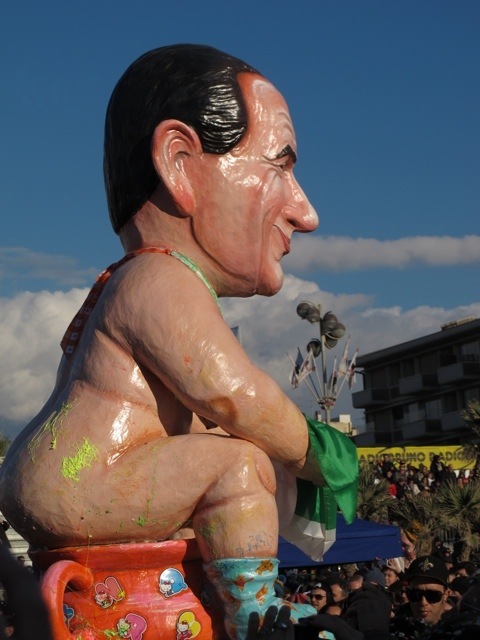 Click here to see my favourite float about the illustrious ex-leader of Italy, here to see the fabulous Big Green Man and here to see some of the floats from 2012. In the next post I will show you some of the people in the audience as well. People love to dress up and have a great time. There is loud music, dancing and whole families take part in a completely mad event. Wonderful work in these floats. It is a fun event…enjoyed by thousands. Great photos, Debra! 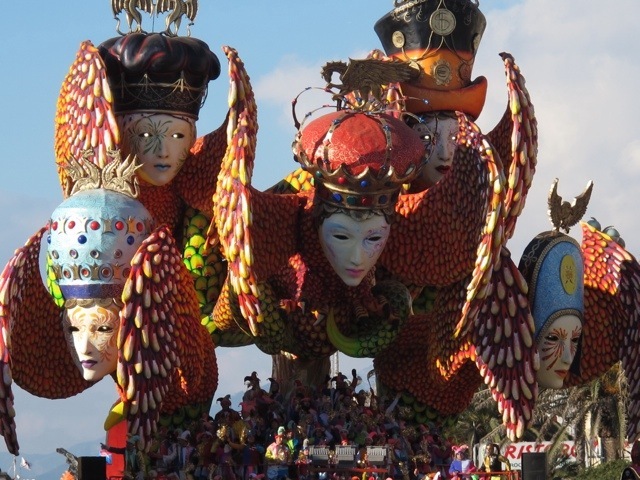 The themes are quite funny and thoroughly irreverent, but then, it’s Carnevale. Anything goes! We have 40 days of penance during Lent! If you are easily offended you should stay at home…there is some serious social comment here, done in a fun way. Go early to get a car park. The whole town is full for Carnevale. Lovely photos. You have inspired me; I need to go and see it on Sunday! I hope you have a fine sunny day. At least you don’t have far to go. Fantastic images. Looks like quite the party. It is a huge party where everyone appears to have a wondeeful time. 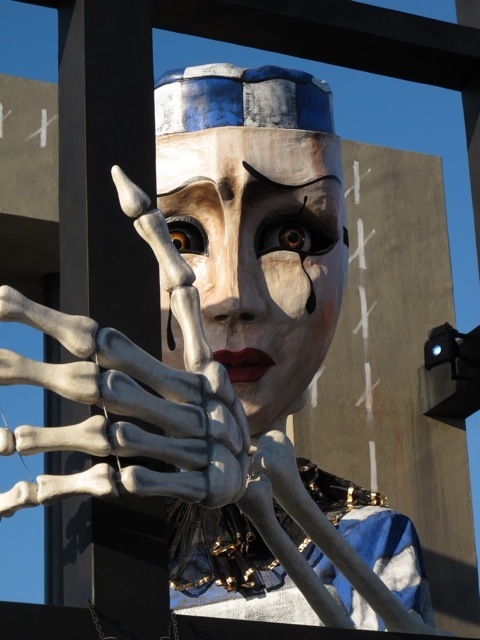 Once again, we’re loving your images from Carnevale! and we’ve revisited years past as well. The green man is still amazing…and this year, my vote can’t help but go to those beautiful haunting Venetian masks…I love those. They are no doubt working on the floats for next year right now. The years go far too quickly…I try not to think about it. and those beautiful blue skies were the perfect backdrop to your brilliant photos. It was actually freezing. We had to keep moving to stop our fingers and toes going numb with the cold. Beautiful photos! Great color against the sunny blue sky. 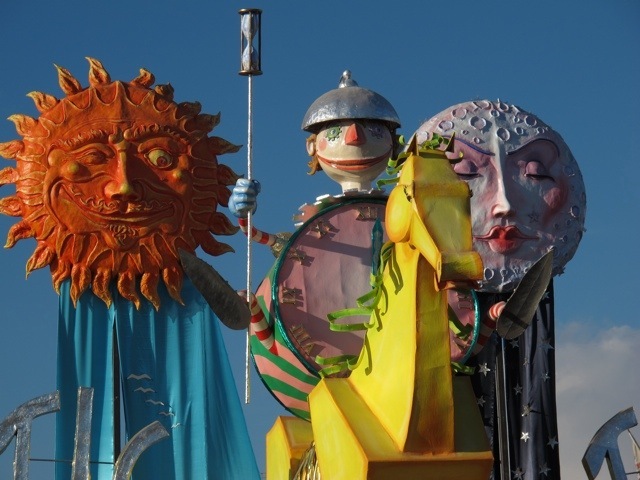 The blue sky makes a great backdrop for the colourful floats. Thank you so much for the amazing pictures! Truly enjoyed them! It is a fun event…you should go one year. There is such skill in those figures – isn’t the meaning behind carnevale something to do with the dark side of human nature anyway? Must ask Professor Google. I do like the No Progress Party float – it could well apply to our politicians – and the media circus. There are some dark sides shown at the Carnevale. I was surprised at the blatant criticism of the church in such a Catholic country…not upset, mind you. Ow WOW! I never knew this about Carnevale. The Carnevale I know are of masks. Very interesting, indeed. The floats are so provoking. Still candid though. I’m not very surprised. Italians are known to be very vocal in expressing whatever it is they want. LOVE this post. The pictures are so lively. Worth looking at for a long time to see each detail. I would love to go to such event. Come to Italy next February and join in…it is a lot of fun, and thought provoking. The brilliant artistry and the pull no punches satire is a fascinating mix. Under a perfect blue sky too. Thank you for taking us there again this year Debra. They’re quite brilliant! I wonder if there’s somewhere where they explain some of the floats? Some of them are so intriguing! That would be a great idea. I would love to know more about the meanings of the floats. The photos were a bit of a challenge this year. The parade was a bit later in the day and there were shadows all over the place. It does make a difference when you start taking photos specifically for the blog. Certainly interesting work … and with quite the sense of humor. By the way, I hope you have a chance to drop by on Sunday & Monday. I really like the serious criticism that is on show at the Carnevale. Italians have such a great sense of humor – the politicians on potty’s with soothers in their mouths is hilarious. I can’t imagine a float like that over here. I’m sure this could happen in Australia. It doesn’t, but we have some very critical political cartoonists. Looks like you had an excellent viewing spot. People are so creative and talented in making these figures. Do you know how they get their spot in the parade? Is it like Mardi Gras where they have the traditions of Kewes that develop the parades? I don’t know anything about the behind the scenes workings of Carnevale. I will go to the museum one day to see if I can find out more. I wandered for most of the time I was there. We had to keep moving to keep warm, it was freezing despite the blue sky. Gosh I LOVE the political satire going on here! And the plastic surgery dummies. We really need more of this in Italy! The satire is not subtle…I think it is great that people are able to comment on things they are concerned about.